Justin was named on the Associated Press First Team Class B linebacker in 2004. He was also named the Defensive Player of the Year by the Lansing State Journal. He was the team captain and leader of a tough bruising defense that mimicked Justin’s style of play. He also played tight end on a powerful running offense and would occasionally drop back into the backfield to open a hole as a blocking back or getting the ball and running for some tough yards. Justin was perhaps the best and the last in a line of Braska brothers that excelled in football at DeWitt. 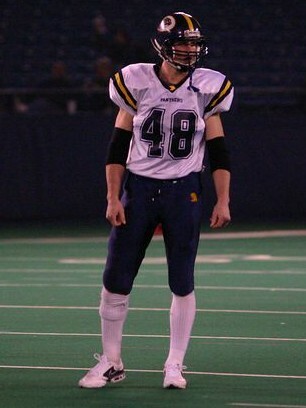 Justin was the leader of the 2004 team that returned to the Silverdome in Division IV. Despite all of the accolades and accomplishments given to him, his quiet toughness was exemplified by playing his entire senior with a partially torn ACL. After being a three year starter at DeWitt, Justin went on to play and start at Western Michigan University.